Several years ago, a young lady by the name of Alanis Morissette sang a song called “Isn’t it Ironic?” A friend gave me a copy of a CD he and his band did with a cover of that song and it reminded me of how much that tune catches my attention. In the lyrics she asks questions which can bum you out if you think about it too much. It has lines like “it’s like rain on your wedding day . . . it’s like a free ride when you’ve already paid . . . it’s like good advice that you just didn’t take . . .” Well, you get the point. I’d like to take a moment to turn the lens around so to speak. You know, most of us can name the wrongs and negative aspects of our lives a lot quicker than we can name the good things . . . isn’t it ironic that we have a hard time remembering the good? It’s like God saying don’t forget I love you. Take a moment to count you blessings today. You Can’t Have it Both Ways . . . Using logic (maybe foreign to politicians) a + b should equal church attendance and religion is way up. Why then are we having such a hard time getting folks to come in from their weekend getaways and other recreative activities? Many of those who aren’t away, are worn out from all of their extracurricular activities during the week. If the economy is as bad as we are told, we should have lines of folks waiting to get in. (Since they have to check their guns at the door.) We sure don’t want any gun play during the offertory hymn. No, Mr. Obama, we don’t cling to our guns because of bad times, we do so because the Constitution tells us we can. As for “religion”, I don’t cling to mine, I stand on my faith. My Lord clings to me. And you are welcome to come hear me preach about Him any time. It’s 3 am, who will answer the phone? On the 6 o’clock news this evening, one segment of the political coverage d’ jour was of Hillary Clinton getting her street creds in Pennsylvania by hanging out in bars and slamming a shot of whiskey. One newscaster earlier in the day said she had been “sipping Crown Royal (whiskey) from a glass” and then did a shot. It strikes me this is not the action of a novice drinker. Especially in the day and age we live in in which every word and turn of a phrase is parsed over and over for both content and intent, it seems odd that one who has so much riding on every action would take such a chance. So is Hillary a old pro at the drinking game? If that is the case, who will answer that ringing phone at 3 am in the White House and what condition might she be in? This past Tuesday, as a part of the NC Sheriff’s Chaplain Association conference, a group of us were treated to a trip to the Billy Graham Library in Charlotte. What an awesome trip that was! When you enter the library, you go through doors which are at the foot of a huge cross. Words can not describe the collection of memorabilia & mementoes on display. The lives which have been touched by the Gospel message throughout the years as a result of the crusades, only God can measure. But, just as the journey through the museum begins at the foot of the cross, so our own personal journey as believers, begins at the foot of the cross. In the prayer garden, at the base of a walkway in the shape of a cross, Ruth Graham is buried – at the foot of the cross. As Christians our journey not only begins at the foot of the cross, it ends there. In between the place where we start and the place where we end, is the collection of our words and works. What a challenge to think of the display of each our live’s memorabilia and mementoes. Each day our actions add to the collection, every thing we say and every deed we do is there on display. Have you made anyone thirsty lately? 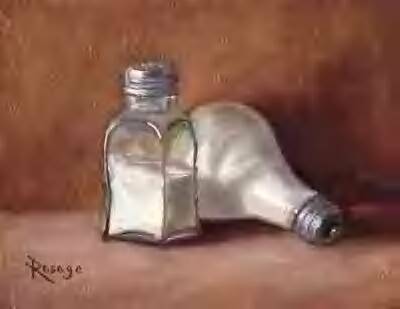 I’ve been thinking lately of Jesus’ challenge for His people to be salt & light. We all know what salt does. It adds spice, preserves, cleanses, etc. That is challenging enough, to be sure. But one of the most common effects of salt is that it causes thirst. As Jesus issued that challenge to His followers, I’m sure that was an aspect He had in mind. It was certainly a characteristic of Christ. When He prayed, others wanted to pray like Him. There were those who were jealous, meaning they wanted to be like Him as well, but were not willing to commit to the life which would give them that power. The challenge for us today is to go beyond the bland, ordinary life. To cause thirst, we should live in a way which creates a thirst in those we come in contact with on a daily basis. Then, we can be the light which leads them to the One Who is the Living Water. Who is the most dangerous preacher from the “religious left?” Is it Jeremiah Wright? Louis Farrakhan? Maybe. However, I think it may be a much more familiar name. How about Oprah Winfrey? “She’s not a preacher,” you may say. Well, she sure is proselytizing for New Age theology. Dangerous? Oprah? It’s easy for most Americans to see those other guys as bubbling cauldrons of hate-filled ideology, but Oprah is so sweet. Why do you think they put the poison in Kool-Aid? Millions of folks watch her shows, listen to her radio programs and slowly consume her ear-tickling teachings. Several weeks ago Oprah launched a new interactive feature of her “book club” (read church). They meet on Monday nights on the internet and have a growing congregation. It is widely advertised on satellite radio and probably many other places – but that is where I’ve heard it most.